Despite the floods, McDonald’s noted further gains last year, according to its CEO. The number of customers rose to 36.5 million in comparison with 33.6 in 2001, sales were CZK 1.96 billion in comparison with CZK 1.77 billion in 2001 and the number of restaurants increased to 68. The Czech managing director of American Express achieved a remarkable promotion – to managing director for the eastern European region, including Russia. Already in charge of 100 Czech employees, he now has responsibility for 300 more. The founder of the “People in Need” charity is the first Czech to receive the “European of the Year” prize from Reader’s Digest magazine, for pursuing principles of democracy. He is going to give the CZK 300,000 award to the widows and orphans in Nepal. The co-owner of investment company Cimex, suspected of a billion crown fraud in the Chomutov Válcovny trub, was caught by police in the USA. He paid bail and now is being held under house arrest for the decision of whether he will be transported to the Czech Republic for prosecution. The ODS deputy faces criticism for obtaining a flat in Pec pod Sněžkou, which was built with state assistance. He does not have the right to a subsidized flat, because he does not live there permanently, and hence does not fulfil the legal conditions. In his attempt to improve his profile, the ČSSD candidate for president claimed that twenty years ago, he judged a Charter 77 signatory, Jiří Heger, whose job he helped to keep. It was later discovered that Heger was not a Charter 77 signatory, but a communist. 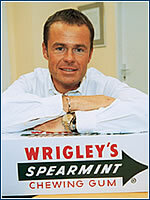 DAVID KRAJNÝ(38), the head of the Czech branch of the international firm Wrigley, is proof of what a person can achieve if he persistently follows his dream. After graduating from the School of Economics, he went to work for Strojimport, but when the communist regime fell he decided to rush headlong into the market economy. He worked as a limousine driver for VIP clients for nearly a year while intensively seeking employment. In 1990 he read an ad in which Wrigley was looking for a local manager. Although he was discouraged by many and wasn’t given a chance in his interview, after a selection process that took over a year he was chosen. Like a pike among lazy carps, he seized the opportunity, darting deftly through the environment of inchoate capitalism. “I see my competitive advantage in my entrepreneurial and ravenous spirit, and I reacted quickly to changing conditions,” he says. Now, after 11 years with the company, he proudly recalls his start, when he worked alone in one room. Gradually this one-man show came to include 130 employees, and from an original truckload of chewing gum that took a year to sell, the firm now brings in CZK 2 billion per year and holds a 90% market share. The Prague headquarters, which covers all of central and eastern Europe, was named Obchod magazine’s Czech Top Store in 1999, as the second most productive firm in the Czech Republic and Slovakia. Krajný’s passion for sports and speed in general is reflected in his attitude towards work. “I love competing, and I really like winning,” he says, adding nearly apologetically, “this is also where my impatience with my colleagues’ work comes from. I want everything right away, but that’s impossible.” This year Wrigley will need his enthusiasm – the firm is launching Orbit drops candies, and aspires to become this country’s largest confections producer. 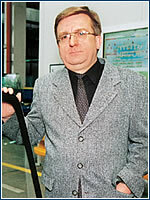 THE EXECUTIVE DIRECTOR of Saint-Gobain Sekurit ČR announced a company motto for last year: “Only one can be the best”. He managed to live up to this in full on 12 November 2002, when prime minister Vladimír Špidla handed him the Czech Republic National Award for Quality. This Czech award isn’t just a mark of excellent product quality, but also of high management standards in all company processes, including manufacturing, finance, personnel, and so on. Saint-Gobain Sekurit ČR, headquartered in Hořovice, has been manufacturing windshields for the automotive industry since 1996. Its customers include Škoda Auto, Volkswagen, Ford-Jaguar, BMW, and Daimler Chrysler. Considering its nearly 50% share of the European market, one can say that nearly every other car in Europe has a windshield made by Saint-Gobain Sekurit International. True, its Hořovice branch, with 330 employees, is small, but it’s an important member of the group. Its winning of the gold medal was preceded by a complex process. “The competition criteria declared by the Czech Society for Quality were very tough. Several hundred firms gave up at the very beginning, and there were about twenty finalists,” says Hanzlík (47), adding that competition criteria were checked by a renowned team of auditors that, he says, particularly appreciated the modern and thorough management. “We want to be progressive. All our processes are now electronic, we constantly acquire knowledge, and we invest in people,” he says, ticking off his firm’s strengths. Hanzlík sees the award as a small personal victory as well, because some employees who were initially skeptical about the competition changed their views, and now they’re even more motivated to contribute to the company’s functioning. If the firm can sustain this trend, its CZK 100 million investment last year in equipment will pay off with a 15% production increase in 2003, it will confirm its market position, and its director will not regret the time he spends each day commuting 70 kilometers between Prague and Hořovice.